The master bath is usually a full bath located in or near the master bedroom and generally designed exclusively for the use of one or two people. It is a functional space that many homeowners have come to think of as de rigueur in new construction and necessary addition to renovations of older homes. 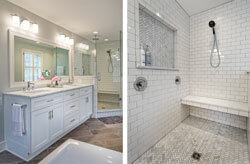 The renovation of a master bathroom is the most popular project on most homeowners’ wish lists. A master bath incorporates the usual components of bathrooms everywhere but has enjoyed special attention in recent years, as one area of the home where luxury can be integrated on a smaller, more wallet-friendly scale and enjoyed on a daily basis. It’s true that renovated master baths can increase the value of a home, but they also improve the function of a room that receives daily use. Perhaps because of this, a thoughtfully updated master bath can deliver a circadian sense of contentment, even relaxation, that is the hallmark of well-designed spaces. 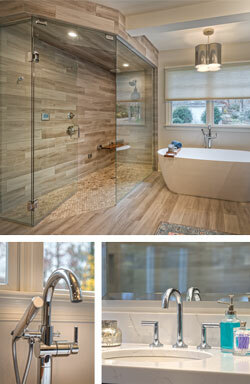 A well-designed renovation was the goal in fact, for three builders in the Roanoke Valley recently, as they worked with area homeowners to design and remodel dated master baths in older homes creating new spaces that are as beautiful as they are functional. Moving to a sprawling mid-century ranchstyle home with stunning views of the Roanoke Valley was a logical next step for the Carters, now empty-nesters. The home was solidly built but hadn’t been remodeled in decades, so Meg immediately called builder Rob Schroeder of RJS Builders. Meg and Rob had collaborated on several successful projects in the past, so Meg was confident that together they could design and plan a renovation that would both update and transform master bath space. Thankfully the sizeable existing master bath had a footprint that worked for the Carters, but its last renovation had been in the 1980s. “The master bath really needed a facelift,” explains Meg, “It was a great layout, but the circa 1980s décor and fixtures felt a bit dated. We wanted to update the colors and finishes. We’d worked with Rob on other projects and knew he understood what we were hoping to accomplish,” says Meg. Because the footprint of the bathroom was still functional, it meant that all sinks, shower, tub and toilet could be replaced without having to redo the plumbing. “We pretty much gutted the room;” says Rob, “removing the old tile and the platform tub and choosing a porcelain tile with the look of Carrara marble for the floors and shower and a free- standing soaker tub.” Meg, who loves the clean look of Carrara, opted for the porcelain tile look-alike because of the myriad of warnings she’d heard about the upkeep of marble and other porous surfaces, especially in a bathroom. The one exception was the vanity top. “I saw this piece of marble with very subtle pale green and blue veining and just fell in love,” laughs Meg, “It married perfectly with the wallpaper I’d chosen for the master bath and the colors in my master bedroom. I just had to have it!” The vanity surface has a “leathered” finish, which compliments Meg’s hardware selections in a unique bronze-gold finish. 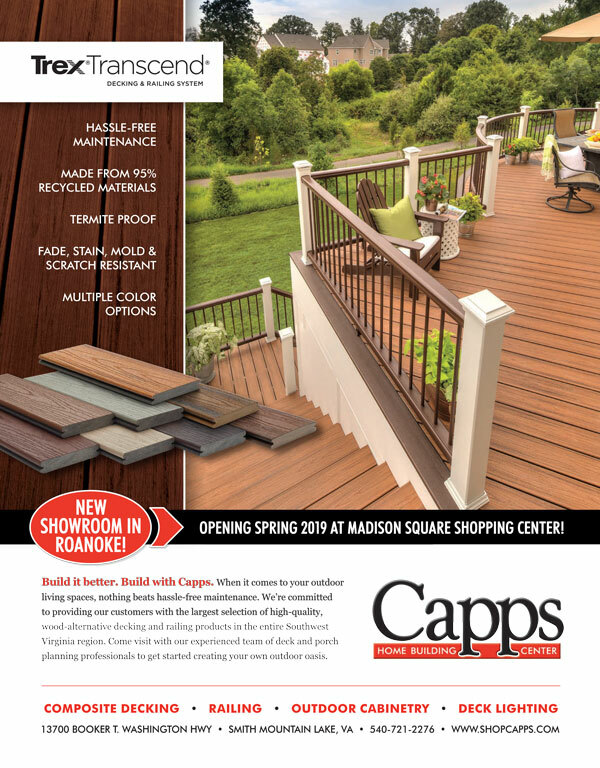 Walt Derey, President of Pitman Construction, has done his share of bath remodels, but when doing work for friends, it can sometimes be stressful. Fortunately for Walt, the clients who called him seeking a bath remodel in their early 20th century home, about a year ago, were not only friends, they’d also been clients before. “We’d already done their kitchen and another bathroom for them, so we were pleased to be going in to help them with the master bath,” says Walt. It was, as he describes, a pretty average master bath that had been remodeled in the late 1990s, but it felt a little tired and had a built-in closet that took up a lot of space and made the room feel broken up and cramped. 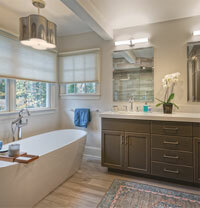 “The clients wanted to remodel the bathroom to ‘live big,’” he explains, “Meaning they wanted their master bath to feel larger even if we weren’t adding any square footage. They loved a sleek, transitional look and wanted that contemporary feel in their master bath.” So Walt began to work on a design that would open up the room and give the couple the space they’d dreamed of. 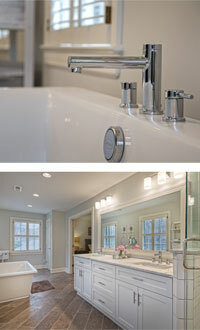 About two months after work began, Walt’s clients had a master bath that they loved. The flooring and walls are rectangular ceramic wood-look tiles, which give the room a sleek, linear look while the wood-tones of the tile give the room a more rustic, warm feel. The shower itself is a “no-step” walk-in shower and the custom glass surround goes all the way to the ceiling to keep the steam in when it’s operating in steam bath mode. The flooring is an intricate herringbone pattern and there are two separate shower heads and a sleek wooden flip-down bench. Jennifer and Luke Carignan, young professionals who relocated to Roanoke a couple of years ago, purchased a home in the Edge Hill neighborhood. Jennifer and Luke loved the spacious home after years of cramped living in Chicago and Washington, D.C., reveling in their large master bedroom and space for their Staffordshire terriers to run. 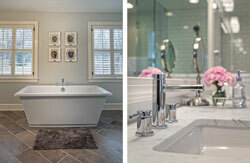 The one thing they felt the home needed, was updated bathrooms—the master bath in particular. They called Jack Hamlin, owner of Hamlin Builders for help renovating the small “vintage” master bath attached to their master bedroom. Complete with baby-blue tiled walls, shower and floors, a single pedestal sink and a bathtub awkwardly tucked in next to the shower, the master bath was like stepping back in time to the mid 20th century. The Carignans felt the master bath was ready for some updating. When Jack Hamlin first laid eyes on Jennifer and Luke Carignan’s master bedroom, he thought it was the largest master he’d ever seen. The attached master bath? Not so much. “So I floated an idea,” recalls Jack, “What if we take some square footage from the master bedroom to enlarge the master bath?” He began to design a bath that would annex approximately 200 square feet from the master bedroom and enlarge the bathroom by almost two-thirds. The Carignans loved the idea of a bigger master bath but were concerned about losing the natural light that flooded the bedroom through several large windows along the back of the house—just the area that Jack proposed annexing. “I was concerned about making our bedroom feel dark,” explains Jennifer, “and I wanted to preserve the beautiful natural light, so it was really fortunate that we came upon a solution: a wide doorway and glass french doors.” The french doors meant that all the natural light flooded straight through the master bath and illuminated the bedroom as well. There were challenges of course, such as the functional radiant heating system in the ceiling which had to be drained and disconnected in order to install cup lighting. Both the Carignans and Jack worried that given the size of the bath and the simple palette of grey and subway tile for the walls, the large expanses of taupe rectangular tile, would feel cavernous. Jack designed a 30 square foot tiled shower with custom glass surround and Carrara marble tile floor and nook laid in a herringbone pattern, which took up a lot of space and set the flooring tiles on a 45-degree angle to help to break up some of the lines visually. 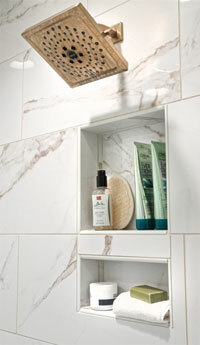 The vanity is custom made and also covered in Carrara with his and hers drop-in sinks. Even though many homeowners are forgoing the traditional bathtub in favor of larger showers, Jennifer was unwilling to part with the idea of a tub. “I’m generally a bath person,” she explains, “I prefer a bath to a shower.” Since space was no longer an issue, Hamlin ordered her a large soaking tub, which he placed underneath the bank of windows. When viewed from the master bedroom through the french doors this creates a stunning focal point for this beautiful master bath. Next Post: Master Gardeners 2.0 |What Does Your Garden Grow?